As part of the your operations, you will need to prepare reports and print forms (such as invoices). In MoneyWorks you have the option of printing or emailing these, making PDF or text files, or even transferring the information into Word, Excel or Numbers. These are all done in the in the same, consistent manner. Reports: To print a report, choose the report from the Reports menu. The Report Settings dialog box is displayed. For Datacentre users, a double-arrow is displayed above the Output pop-up menu if the report is going to be prepared on the server instead of the client. In the transaction list only, clicking the Print Details toolbar button will print the transactions showing their detail lines. This will enable you to see how a transaction was coded, either in terms of its items, or the general ledger debits and credits that underpin the transaction (i.e. the underlying accounting journal). To print a report that is based on the list, click on the report in the Reports section in the list sidebar. To print a form (invoice) use the right hand Print List button. To print a list, click the left hand Print List toolbar button. Forms: To print a form (receipt, invoice, product label, job sheet, etc. ), highlight the records you want to print in the list, then choose Print «record» from the Command menu (or press Ctrl-[/⌘-[), or click the Print Form toolbar button. 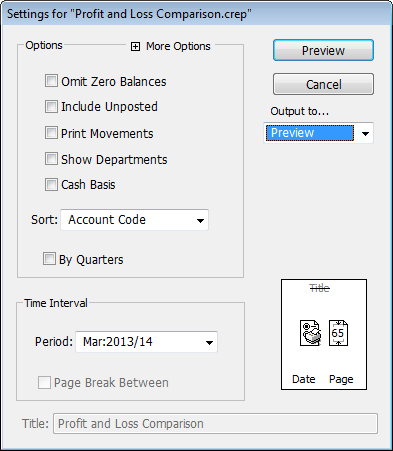 The Print Form dialog box is displayed. Forms are discussed in more detail in Printing Forms. These settings windows all have common icons and buttons which you use to determine the page size, output medium and so forth. There are also specific options that depend on the type of object being printed (for example, what Period to use when printing a report)—these are discussed elsewhere.